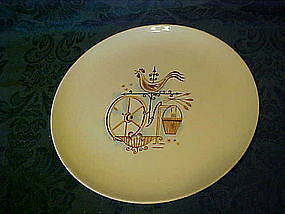 10 1/4" dinner plate by Taylor Smith in the Ever yours, Weathervane pattern. Pretty country motif with a rooster weathervane, bucket wagon wheel ect. I have three of the dinner plates available. Price is for each, and all are in perfect condition. I have a few more pieces to this set listed in the catalog.